Another activity done during Lao New Year is this one shown here. 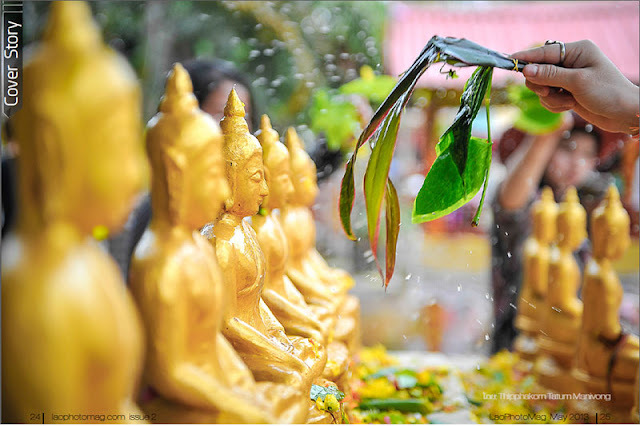 It's tradition to visit as many Buddhist temples as you can to bless the Buddha statues. In Lao, it's called sohng pa ສົງພຣະ. The monks will have brought out all the Buddha statues in the temple and place them on a table. There will also be a bowl of blessed water that adherents and followers use to bless the Buddha statues. Small cups for pouring or leaves for sprinkling blessed water will also be available. While doing this act, people will quietly make a prayer.